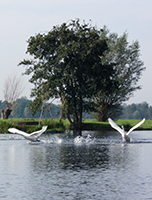 The Carp Pit is a unique and quiet piece of nature in the Krimpenerwaard with a historical link to being an old ice skating rink with a small stone house. € 230,00. 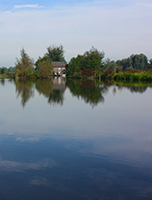 From this start tariff, additional fishers or guests can be added per night. During the Summer Holidays an additional holiday tariff is charged! You can park your car and unload your gear at the Skeeler / Ice skating rink at the end of the Sportlaan. You will continue your journey by boat to the Carp Pit. 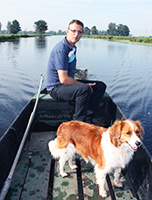 We will bring you with an original South Holland canal boat. This plain small house with simple facilities has one living room, a toilet and a small kitchen with a jerrycan water and gas. 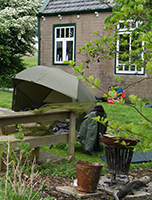 It is allowed to camp with a small tent or bivvy on the grass in front of the house. 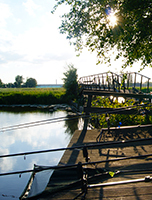 For your stay at the Carp Pit we have a traditional boat (schouw) with electric motor ready. This transit will only take 10 minutes. This schouw is large enough for three people with full gear.